Me -otherwise known in our group as "Regina the I" - and Regina - known as "Regina One Eye"
Double trouble no matter how you spell it! So this is how my weekend started - almost. I encountered this little guy at Jill's house, after a full day of driving (that started out in 39 degree rain/snow ick at 5:00 AM), a stop at Fabric Shack and Best Friends, and the most delicious peanut butter pie (that I did not get a picture of). After meeting Sparkle Balls here - and picking up a new turtley friend at JoAnn's (photo to follow) we hung out at Jill's house, getting to bed around 1:30 AM. 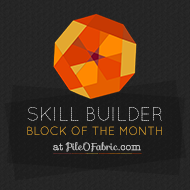 It was great meeting some of our Prolific Online Quilters face to face for the first time. It was a very wonderful start to a very wonderful weekend. More to follow - after I get some sleep! I have the best oldest sister in the world! 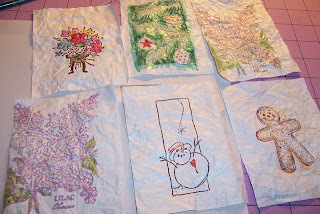 She was supposed to be sending me bricks of fabric for our swap project this year so that I can take them to my retreat next week and work on the quilt. 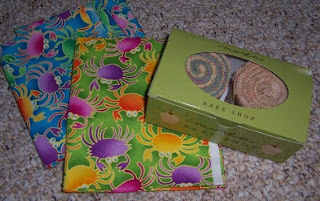 Like these -scraps of turtle fabric for me to add to the Munchkin's quilt, and a couple of Honey Buns from Moda's Bake Shop (with a fun pattern included). The crabbies are leftover from some projects we did together for Mom, and are just such great fun colors to work with, even if you are not crabby. 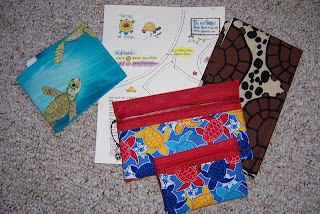 And these - a fun stuffed turtle pattern, two great turtle fabrics, and two WONDERFUL pouches for my tools and cutters and chocolates and stuff. Won't be any doubt whose bags THESE are at the retreat! Oh - and the bricks were in there, too - guess I have to send my half back to her, now. Better get cutting tonight to be sure I have enough! 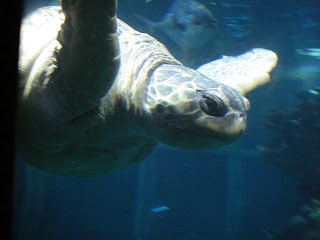 Now you did not think I could manage to come home with JUST a photo of a big swimming sea turtle, now could you??? 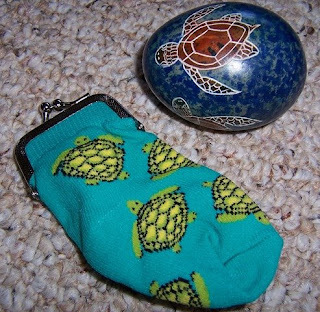 Instead of Easter Chocolate - I got myself a turtle "egg" (made of stone and very heavy) - and instead of an Easter Bonnet I went for a sock purse instead. Perfect for toll and snack money on the way to my retreat next week! And then I found MORE turtles in my mailbox today - turtles all over! I am in heaven! I had a hard time saying goodbye to this quilt - I really really liked how it turned out, and was nearly tempted to go up to the auction and bid on it for myself. It was hard to get a good picture of the binding, but it is made from 10" strips cut from the leftover Layer Cake pieces, so it is variegated all the way around. 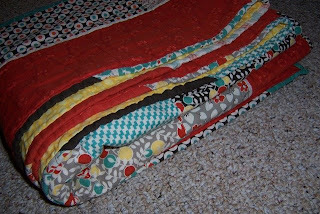 The quilting was a straight grid - and my walking foot and I are finally getting along so it turned out nicely. I did not spray baste anything - just pinned it all very well - and it cooperated. I also tried something new to me with this quilt - I did not pre-wash anything and then washed the entire thing before sending it off to the auction - it got a wonderful crinkly look to it. I hope it keeps its new owners warm and cozy! As promised in my PickAPocket post, here's another option for making the front piece of your PickAPockets - tyvek. 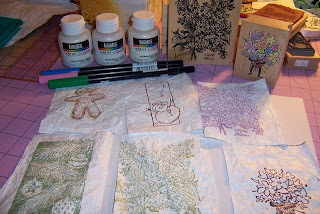 I've written about using tyvek before - I like it as a way to incorporate stamping into my sewn work, as well as a different texture. 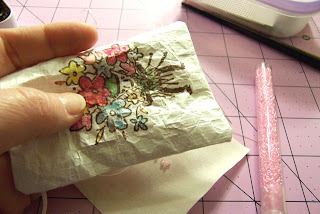 Sure - you can use fabric inks and stamp on muslin, but I find that stamps with fine line detail do not reproduce well that way -the tyvek gives a harder smoother surface and finer image details. For Mr. 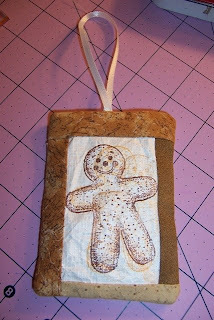 Gingerbread - I stamped the image with light and medium tan inks, then followed up with a dark brown. To pop the overall effect, I stitched strips of various brown fabrics to frame in the stamped area, then assembled the PickAPocket as usual. 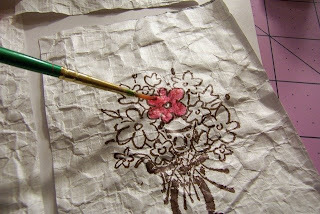 When I am making these, I like to start by cutting my pieces of tyvek to size. I sometimes use just a tyvek front, sometimes I attach fabric borders - but by starting with a piece cut to final size I can then make the decision after I finish the artwork. (see my previous tyvek post for sources of tyvek). 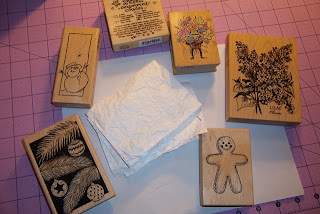 When I have my inks out, I will usually stamp a whole bunch of images, even if I don't plan to use them all right then. I forgot to take a photo of the ink pads, but fast drying inks designed for use on non-porous surfaces work best for this. Water based inks won't dry and will smear on the "plastic" like surface of the tyvek, and you cannot heat dry or heat emboss on tyvek -it will melt. My next fun is coloring the images. I have a lot of water based markers - but like I just mentioned, water based inks will puddle on the tyvek and not dry. However, if you blend them with acrylic paints, the properties of the paint take over, and they will dry, actually relatively quickly. Liquitex makes some cool "interference paints" that are translucent and take on the color of the pen inks, adding some iridescence and sparkle. These are kind of expensive, so get them where you can use a coupon or something. If you have a friend that you craft with -share with them. I find that I use the gold most often, although I have a variety of other colors. When using these paints, less is more. 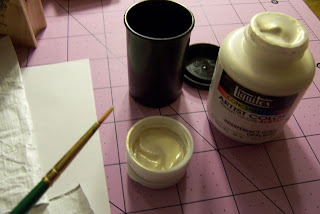 I put a tiny bit of water in a film canister, use a very very fine paint brush, and take the paint out of the cap to avoid over-loading my brush. I don't want to water down the paint, so I wet the brush, wipe a bit of excess water off on the back of my hand, and then dip it into the paint. Continue until your designs are completely painted to your satisfaction. Again, when I have paints out I usually will paint a whole number of fronts at once, even if I am not assembling them right away. Here are a bunch of painted fronts - I was in a spring mood, so I decided to finish up the little guy with the bunch of flowers (top left in this picture). I don't know if you can see from this photo, but the lilacs (top right and bottom left) were a stamp that was bigger than the tyvek piece. I put a piece of scrap paper underneath and just let the stamp overlap -like it fades off the edge. It gave a neat effect. I will finish those up for Mother's Day. 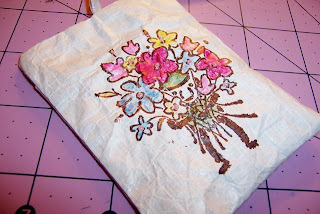 Once the paints are dry, you can add additional embellishing by adding beads to your design. It is hard to see in this photo, but there is a small pink bead at the center of each flower. When adding embellishments such as this, be sure not to take your stitches too close together, or they may pull out if the beads get caught on something. NOTE - if you are using large beads, or beads that will be in the area that will pass under the presser foot during final machine sewing, you may want to wait until after the piece is assembled to add your beadwork or it may cause difficulties in assembly. You are now ready to finish your PickAPocket as usual. 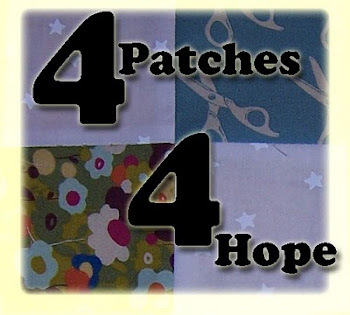 Just use a bit longer stitch length to prevent perforation of the tyvek, and remember that you will need to finger press and not iron the final pocket.